So this came today... 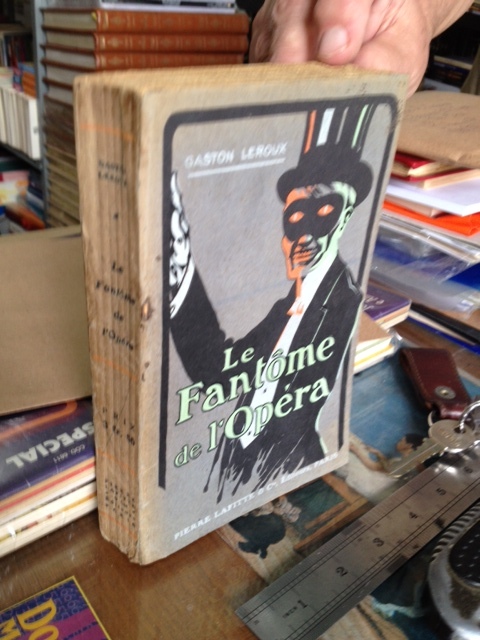 It is a 1910 1st edition of Gaston Leroux’s Le Fantôme de l’Opéra. I purchased it from a wonderful fellow phan last week. I would like to clear up a little bit of misinformation about the 1st French edition. André Castaigne’s illustrations did not first appear in the 1st French edition (despite what you will read on Wikipedia, and in various other print and online sources). They were commissioned by the American publishing company, Bobbs-Merrill, and appeared for the first time in the 1st American Edition of The Phantom of the Opera. This is also why Castaigne’s illustrations do not appear in the 1st British edition published by Mills-Boon. If you look at the illustrations closely, you will see that they are all copyright 1911 by Bobbs-Merrill. They were never copyrighted by Lafitte. 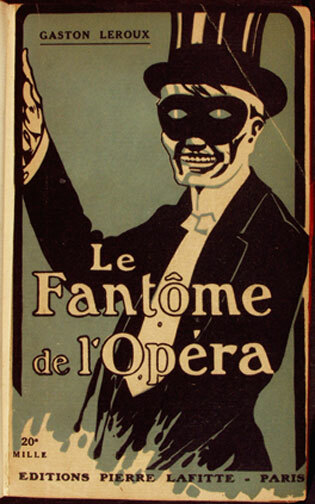 I think this confusion happened because people assumed that since Castaigne was French, he must have illustrated the French edition of Phantom. However, Castaigne had made a name for himself as an illustrator for American publishing companies. Though I am sure that Castaigne being French was an added bonus for Bobbs-Merrill. 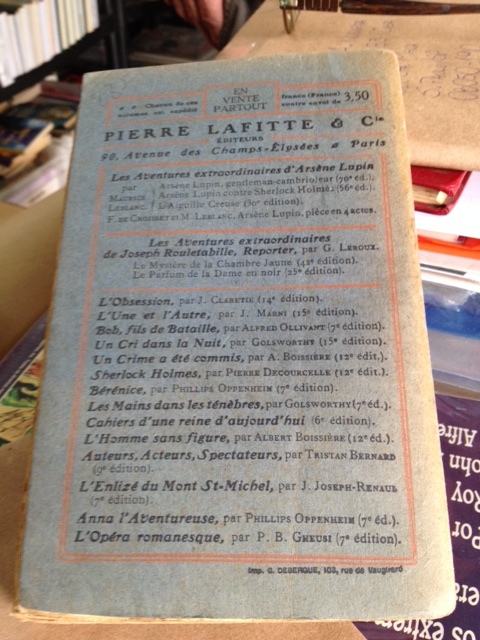 Once I've got myself a good pair of cotton gloves, I will be doing a text analysis of the 1st edition to see if a few typos that appear in my Livre de Poche and Laffont editions originated with the 1st edition. The worst of these is in the "Interesting Vicissitudes" chapter, where in my French text, the Persian refers to Erik as a "fatal rocher," which literally means a "ghastly rock." However, in the Gaulois edition, this appears as, "fatal nocher," which means "ghastly ferryman." Since Erik is in his boat at the time, I think that this is much more likely what Leroux meant, and that something got lost in the transmittal. I always suspected that this was a typo, and was pleased to see it as "nocher" in the Gaulois. Tellingly, Lowell Bair, who was working from a later edition of Leroux's text that, although abridged, had corrected this and other textual errors, translated this phrase as, "the grim ferryman from the Styx." Curiously, the Lofficiers also translated this as, "the ferryman of Hades," though I'm not sure whether they actually drew from a non-1st edition of Leroux's text, or whether they just borrowed from Bair. Wolf, Ribière, and Coward were obviously drawing from the 1st edition, because they translated this as "deadly rock," "perilous reef," and "wrecking rock," respectively. De Mattos (in true de Mattos fashion) doesn't even try to translate this phrase, and omits it entirely. Oh wow -- this is all very cool stuff! Thanks for sharing this with us, FdelOpera! It's really fascinating, these different translations of Leroux's work. Well spotted! I don't think I have the patience to do what you're doing re the textual differences. That plus my first editions are falling apart, so I wouldn't want to even touch them. I think all the differences you've found to date could make for a very interesting article on the translation history of Leroux's novel. 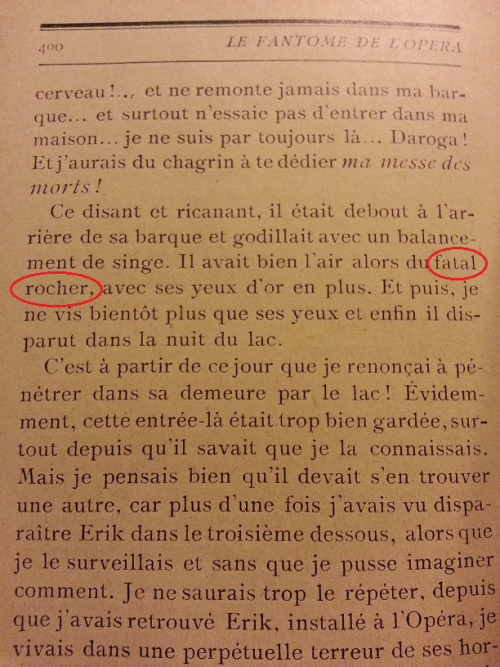 Yes, the 1st edition is the source of Erik being a "fatal rocher" (ghastly rock) instead of a "fatal nocher" (ghastly ferryman). I figured that the 1st edition must have been the source of this typo, but it is nice to see my suspicions confirmed. 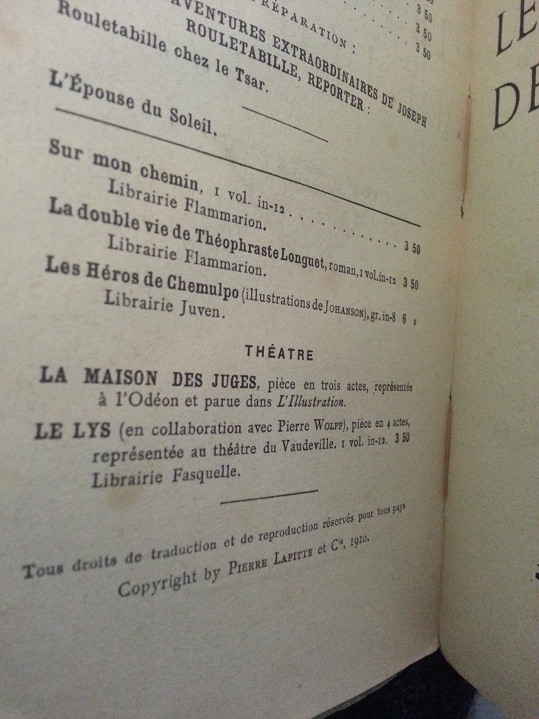 Who actually said that it did appear in the first French edition besides Wikipedia? I know that David Coward does, but David Coward makes quite a few errors, unfortunately, on these kind of details. 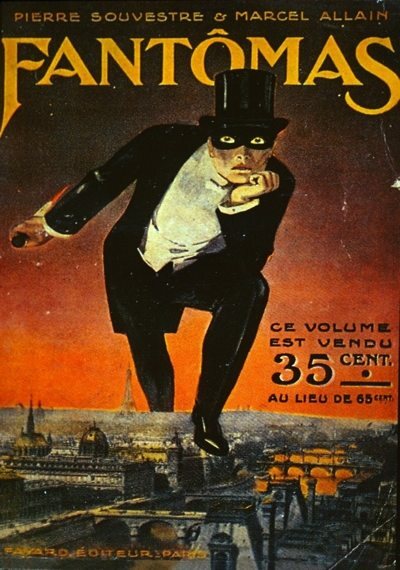 Coward also says erroneously that Castaigne did the famous front cover that's in your avatar. This wasn't Castaigne at all. Incidentally - that cover isn't in your edition is it? Which has led to much confusion on my part as to whether the first editions I have (which are soft-cover with that famous picture on the front) came before or after the hardcover version. I think they predated the hardcover version but that idea seems odd to me, since isn't the usual practice to produce the hardcover version first? 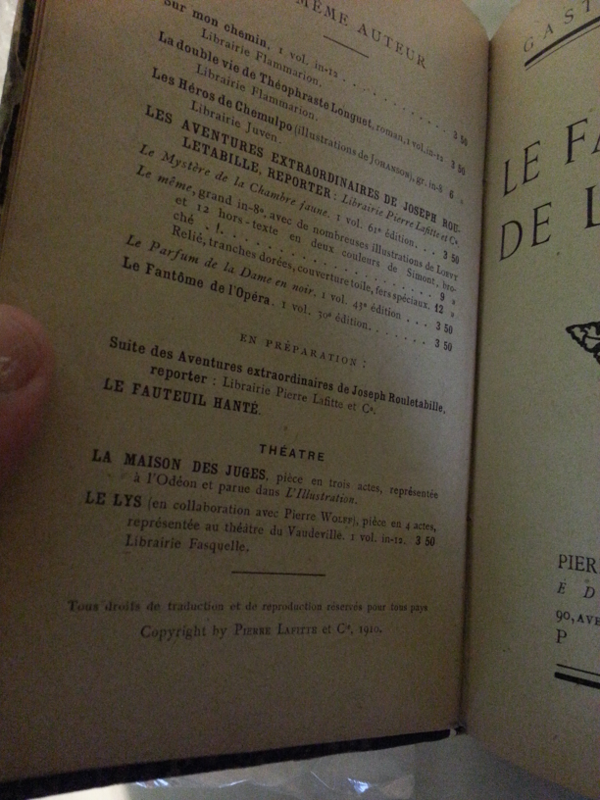 Who actually said that it did appear in the first French edition besides Wikipedia? I know that David Coward does, but David Coward makes quite a few errors, unfortunately, on these kind of details). My assumption, though perhaps wrong, is that my HC edition originally had a dust jacket that displayed the image in my avatar, but that it deteriorated over time and was eventually disposed of. The boards on my edition are not of the kind that are intended to be displayed without a dust jacket -- they are just cardboard, and only the spine is leather. Whereas I prefer David Coward's actual translation to others, such as Ribière's, his annotations are rife with inaccuracies. He also writes that the 1st American Bobbs-Merrill edition was published in 1910 in one of his notes, and he states that the misnumbering in the Gaulois publication happened in Chapter 8, when it really happened in Chapter 7. Ironically, this incorrect dating appears in his introduction to the reprinted supplementary article that first appeared in the 1911 1st American edition, which he claims itself includes an incorrectly dated and sourced reference to Scribner's Magazine. And in further irony, this article also states that Castaigne's illustrations belonged to the 1st American edition -- but I guess that Coward didn't read that part. Good point - I'd completely forgotten (in my tiredness, probably) that your edition probably originally came with a dust jacket. I wonder if there are any copies in existence that still have the dust jacket. I read Coward's endnotes a couple of days ago - quite a few errors in them... I'm surprised really - Coward is well-respected in academic circles and is one of the authorities on Alexandre Dumas. Obviously not on Leroux, though. I reckon he probably spent most of his time polishing the translation at the expense of his introduction and footnotes, which give the impression of being a tad rushed. Jann Matlock obviously did a lot more research than he did for her introduction to Ribière's translation. That said, this might have been worth it if his translation is, as you say, the best one out there. Scorp wrote: Well spotted! I don't think I have the patience to do what you're doing re the textual differences. That plus my first editions are falling apart, so I wouldn't want to even touch them. Scorp, if you don't want to handle your first editions on a daily basis, would it be an option to scan them? That would involve handling them the one time, to put them on the scanner, and then you could refer to the scanned versions, print them out etc. I'm interested in sell the book! If you get interested, please contact me! The spine of your copy looks different - has the book been rebound? Are all the pages intact in the book? I found, here in Brazil, another first edition, with original covers (from 1910). If someone gets interested, please contact me in private! 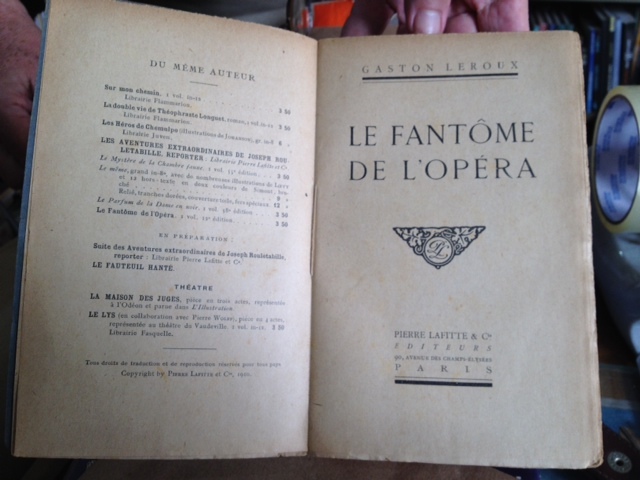 Good to see another 1st edition of Le Fantôme de l'Opéra! 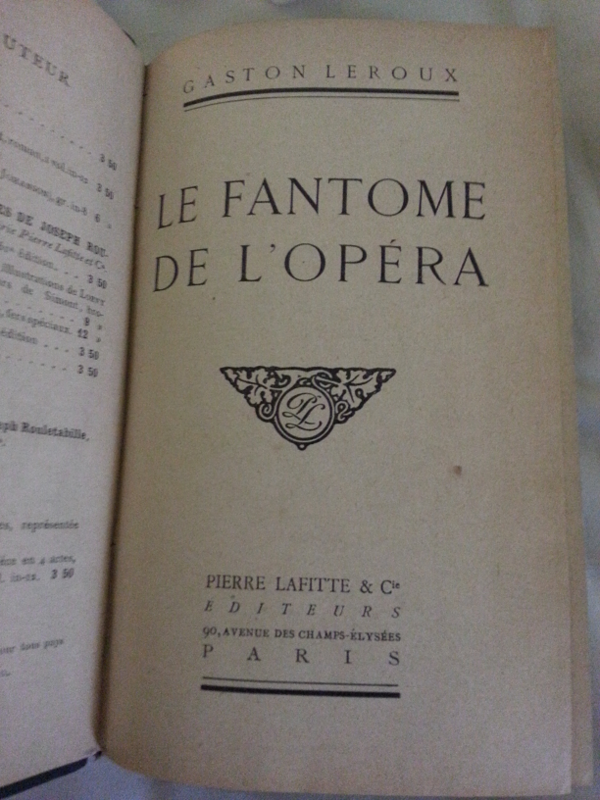 I also recently purchased a copy of this 1st edition original binding of Le Fantôme from a French bookseller on ABE Books. The bookseller must not have known what the book was worth, because they sold it for only about $100 (it is worth much more). do you know, if the cover illustration is really made for the 1911 edition? is there any hint about the artist? micha_i wrote: do you know, if the cover illustration is really made for the 1911 edition? is there any hint about the artist? As for the artist who created this portrait of Erik, their name is not credited in the 1st edition. I have been searching for this information, but so far have been unable to find it. The artist is a man called Cossard. He is uncredited in the first edition of the book, but he did a number of covers for other popular novels of the time. 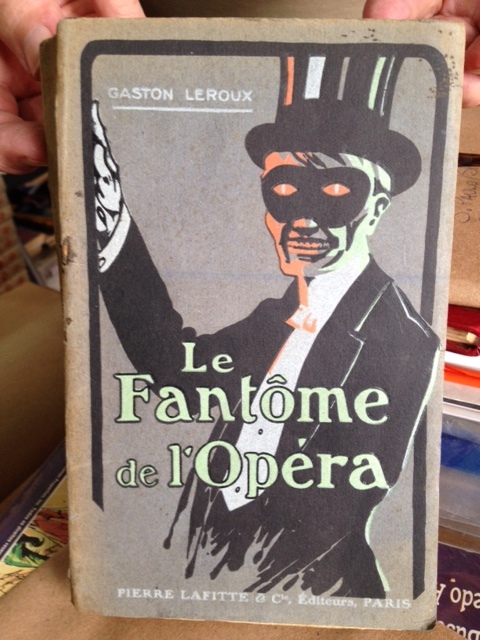 I think I've solved the mystery about how the cover was presented in the first edition of the Leroux's novel. I recently acquired a hardback first edition and this one has the cover. It's not a dustjacket - the cover image by Cossard is on stiff paper that is found when you open the outer board. I note the colouring of the image is different in the first edition from the later ones. The later ones are blueish in colour and the eyes are not gleaming red, but the original has a greyish background with the eyes gleaming red. Scorp wrote: I think I've solved the mystery about how the cover was presented in the first edition of the Leroux's novel. I recently acquired a hardback first edition and this one has the cover. It's not a dustjacket - the cover image by Cossard is on stiff paper that is found when you open the outer board. Great information, Scorp! 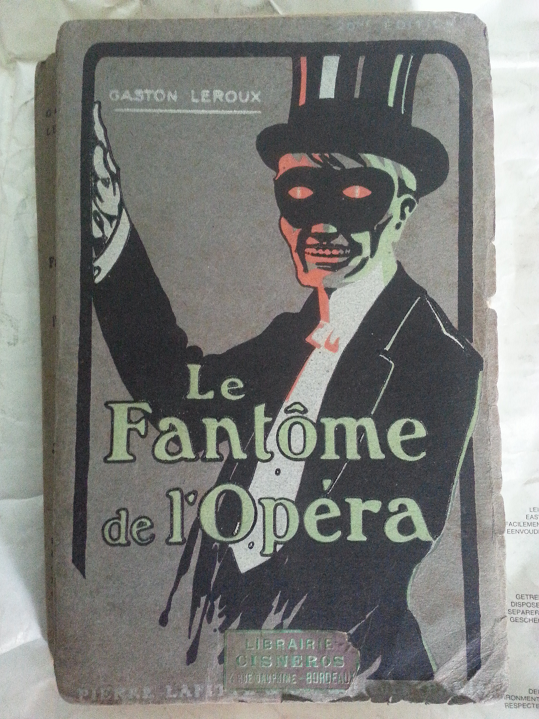 I love that these Fantôme 1st editions are turning up, and being acquired by phans. 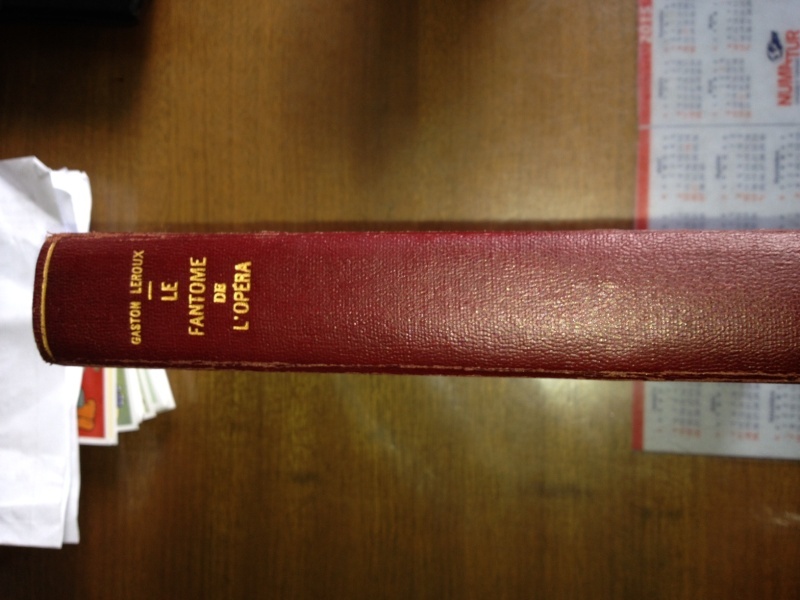 I am wondering -- is the outer binding made of a leather spine with thick paper boards (like thick cardboard), perhaps done in a marbled pattern (like the hardback that I've pictured at the top of this thread)? If so, it may be an original rebinding. 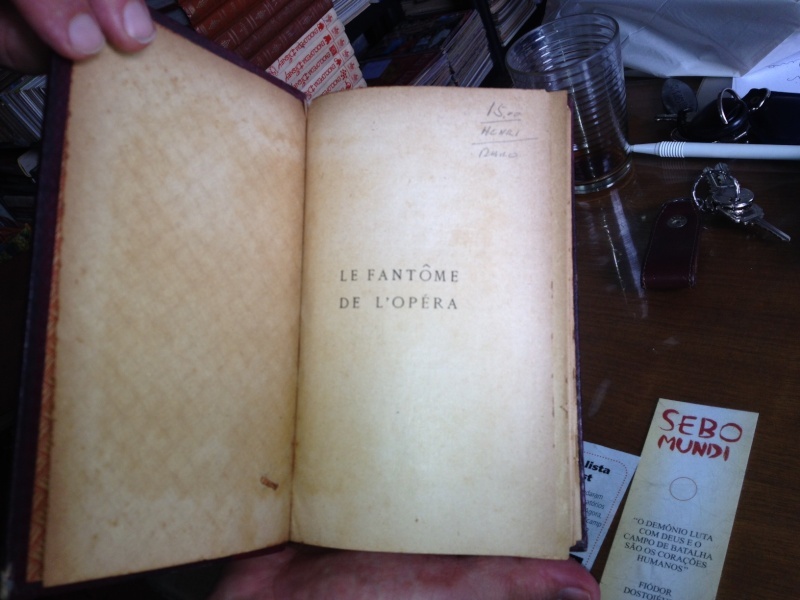 I asked my father (who is a bibliophile and is knowledgeable about French publishing in the late 19th/early 20th century) about my two 1st editions of Le Fantôme (pictured above). The first 1st edition I acquired was the "hardcover" edition, and the second was the paper binding with the grey background and red eyes, as you've described. 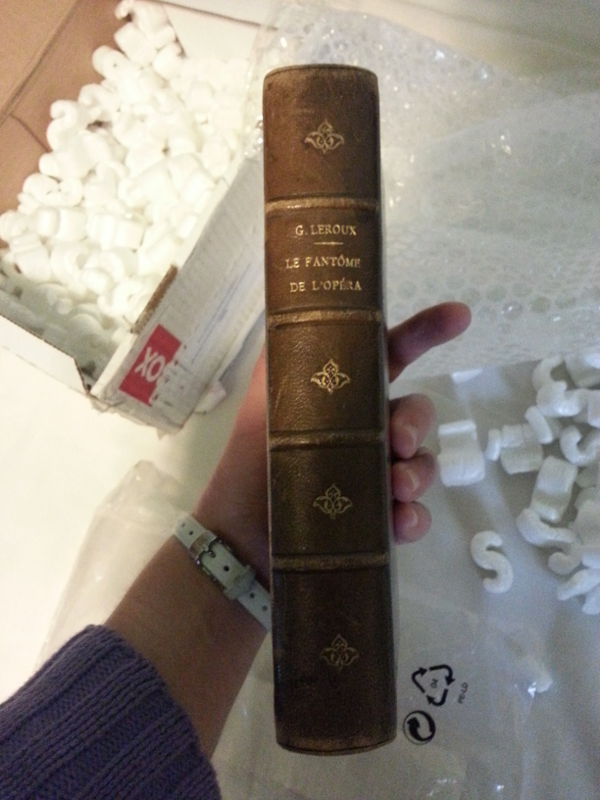 My dad said that the original binding for popular books in France during that time period was done in paper, but that people would often take their books to a binder to have a hard binding attached (that way they could give their library a uniform look). Oftentimes, the original cover would be removed as part of this rebinding process (as in the case of the hardback above), but sometimes the cover would be included in the new binding. My dad said that people often collect these rebound books based on the provenance of the specific binder that was used, and that these original rebindings are worth quite a bit. 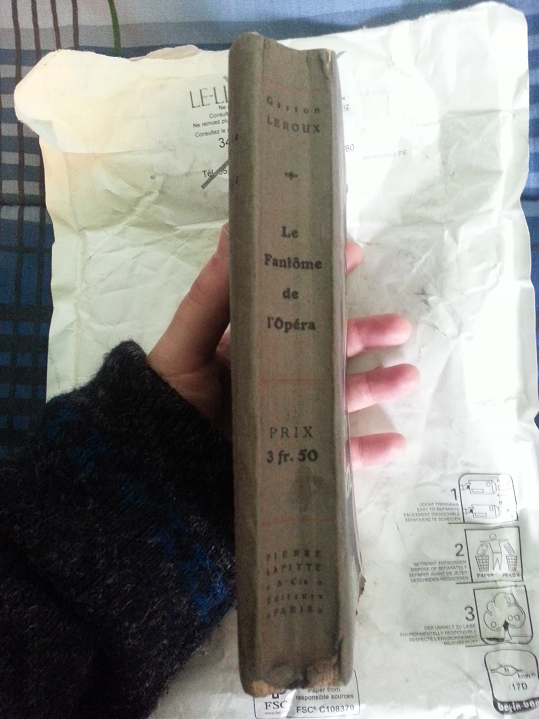 FdelOpera wrote: My dad said that the original binding for popular books in France during that time period was done in paper, but that people would often take their books to a binder to have a hard binding attached (that way they could give their library a uniform look). Oftentimes, the original cover would be removed as part of this rebinding process (as in the case of the hardback above), but sometimes the cover would be included in the new binding. My dad said that people often collect these rebound books based on the provenance of the specific binder that was used, and that these original rebindings are worth quite a bit. Based on some examples I've seen myself, I agree with your father, FdelOpera. People would have books rebound in the same style, so as to achieve a uniform look on their shelves. 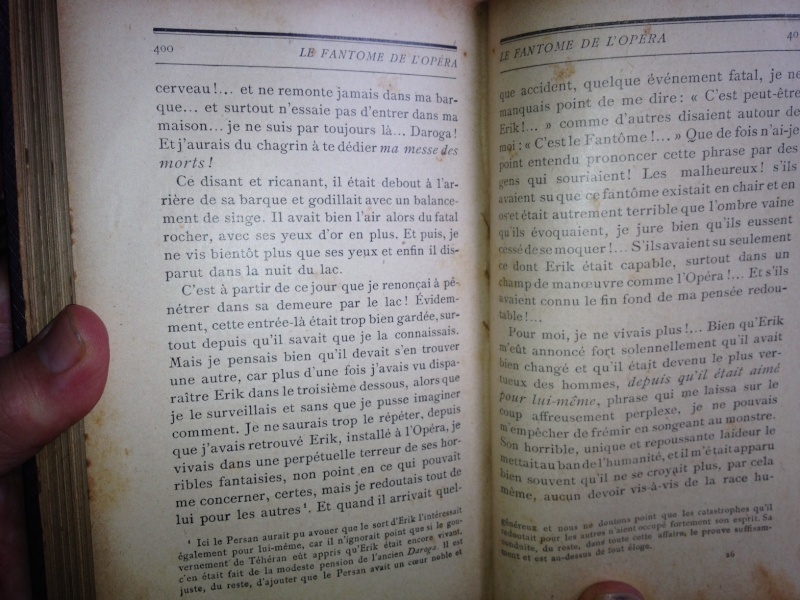 I have some books, among them a first edition (I think) of Leroux's l'Épouse du soleil, that have been rebound in Stockholm. 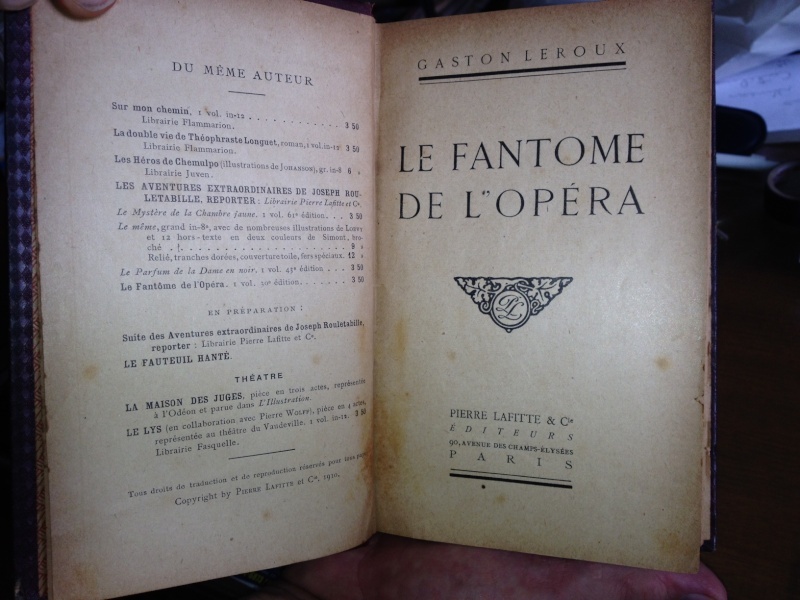 The Leroux from 1913, another book from 1894, the binding is identical. This procedure does have its drawbacks, however, the front cover of my Leroux has been "cut down" to size, some of the text on the bottom of the page is missing. That makes sense. Yes, there are boards around mine, although the original cover (both front and back) is entirely intact. It's not red eyes with a grey background, though, it's red eyes with a kind of blueish indigo background. I am sorry to post on an older topic but it is relevant. I am currently searching for a first edition French copy of the book. I have found one on ABE Books but it was a little too pricey. I expect it to be expensive, but that one was a little too high. Does anyone currently have one that they are looking to sell? Yes, it's expensive! USD 3.750. 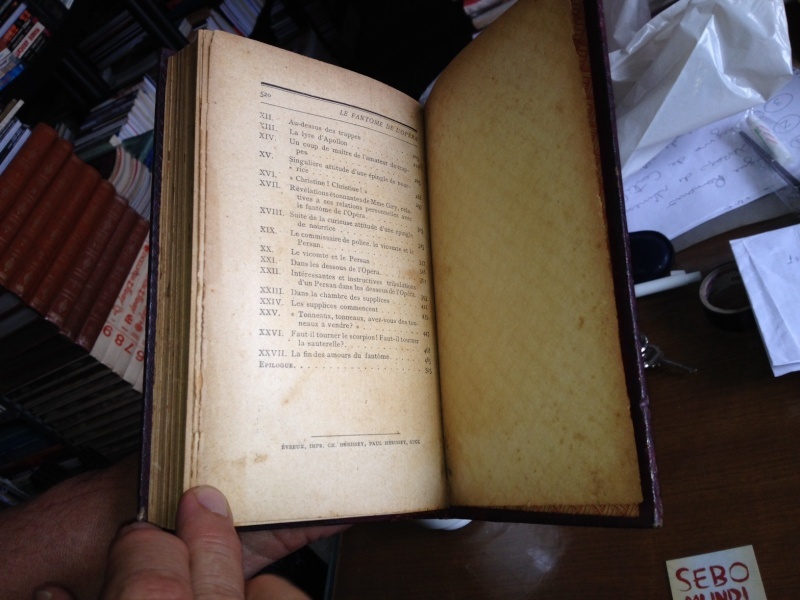 Some time ago I was offered a first edition in rather bad shape for approx USD 2.400. I'm a Phantom fan, but not at that price! 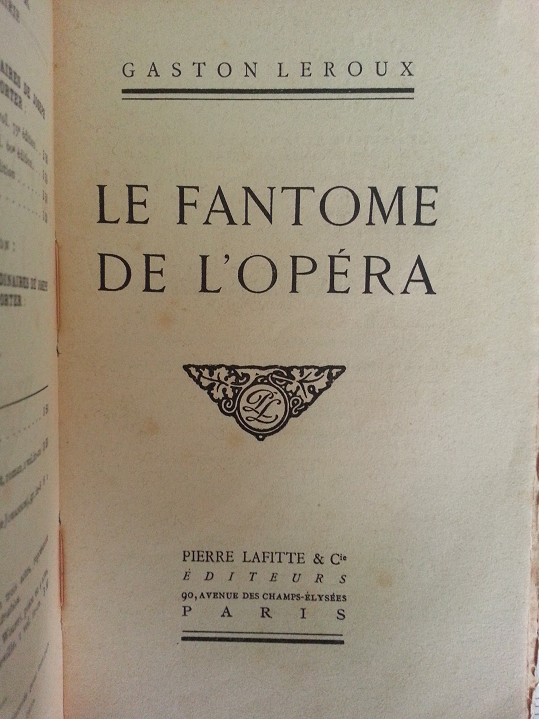 Re: 1st Edition copies of Le Fantome de l'Opera. OUch, that is expensive! And I have to say I'm totally in awe of you guys who do the in-depth textual and translation analysis. Wow! You guys rock! LOL I just sit back and listen!